Start the New Year well informed with the Wall Street Journal. 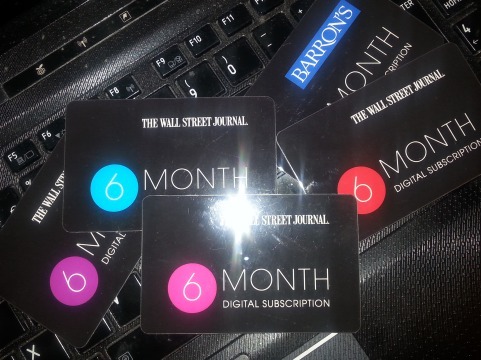 As I regularly edit news stories for Dow Jones Newswires and the Wall Street Journal, I have four FREE six-month digital subscriptions to the Wall Street Journal and one FREE six-month digital subscription to Barron’s financial magazine to give away. Send me a message via the contact page of this website telling me in which three countries I have lived, and one of these subscriptions could be yours!! The first five people to send me the correct answer will win the subscriptions. Of course, you can find the answer on this website. 2 Replies to "FREE 6-month digital subscriptions to the Wall Street Journal up for grabs"